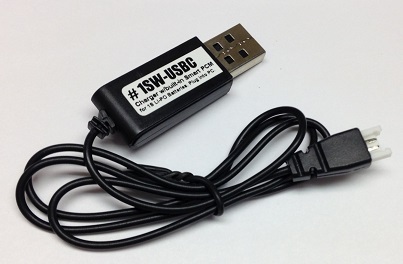 1SW-USBC: Smart Charger for 1S LiPO battery with White connector. Plugs into USB2.0 (via computer, powerBank, or AC-DC wall power supply); plug your 3.7v LiPO battery into the other end. Provides fast, smart charge,with auto shut-off. Charges 1S (3.7volt) Li-PO batteries with the White connector (pictured). BP-H107 : 3.7 volt 380mAh rechargeable Li-PO battery for Walkera and Hubsan mini quad copters, helis, planes, etc. 1S600W : 3.7volt 600mAh Li-POLY 1S rechargeable Battery for SYMA X5 X5C X5C-1 etc. 1S600W: 3.7volt 600mAh Li-POLY 1S rechargeable Battery (20C) for Micro-Helis, Planes. Plugs right into model. Re-charges quickly; can be used over & over! Size: 25mm x 41mm x 8mm. Fits SYMA Explorer X5, X5C 2.4G QuadCopters, & many other models. CVC8S: Cell Voltage Checker for Li-ION, Li-PO, Li-Fe, Li-Mn batteries (1 thru 8 cells in series). Plugs into balance connector. Displays total pack Voltage and individual cell voltages. Has built-in adjustable low-V beep alarm.